Travel to the City by the Bay in style on Capitol Corridor, with comfy seating, plenty of legroom, scenic views, onboard Wi-Fi, and a variety of refreshments from the Café Car. And the best part? No traffic or parking hassles! A special $19 one-way fare is valid for weekend and Monday holiday travel only through April 28, 2019. Tickets must be purchased online one-day in advance. This rate is only available for departures from the Auburn, Rocklin, Roseville, Sacramento, Davis, Fairfield-Vacaville, and Suisun-Fairfield stations and for arrival at the Emeryville, Richmond, or Oakland Jack London Square stations. From Emeryville, a dedicated Capitol Corridor bus connection transports Capitol Corridor train passengers into San Francisco, making stops at the Temporary Transbay Terminal, PIER 39, the Financial District, and the Westfield San Francisco Centre. Note: not all San Francisco stops are served by every bus connection; be sure to check schedules here. The $19 fare covers both the train and bus portions of the one-way trip. * Note: additional transit fares apply for BART and the San Francisco Bay Ferry. Learn more about Capitol Corridor's transit connections here. Click here for more complete terms and conditions and to book your next San Francisco adventure. Visit the Capitol Corridor website for general route and schedule information. You can book a special fare here. Please note, you must enter promo code V441 and select "adult" as the passenger type for all passengers, including children and seniors in order to receive the discount fare. 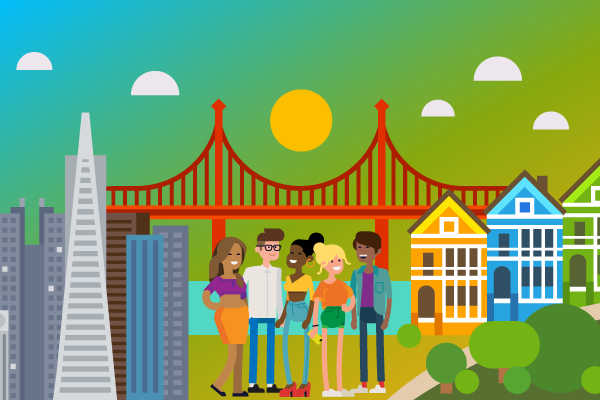 Find quick tips and suggestions for your time in San Francisco here. Activities and attractions near the Temporary Transbay Terminal include the San Francisco Museum of Modern Art (SFMOMA), Yerba Buena Gardens, shopping in Union Square, and San Francisco Giants baseball at Oracle Park. For even more deals and promotions from the Capitol Corridor, click here.